There are lots of opportunities to fill in your answers and fully interact with the book. There are lots of questions and you will need to dig deep to answer them. It challenges your beliefs and values and you will need to consider your skills and consider where you can transfer them in order to achieve what you want as a parent. How do you use feedback as a parent, both in terms of feedback you give to your child and the feedback you receive? We all process things differently, putting our own interpretation on events and communication. This is particularly so when we compare ourselves with our children or teenagers. Do you delete, distort or generalise? In this book you’ll find out whether you are visual, auditory or kinaesthetic and understand the implications. You’ll be introduced to the Logical Levels of Change Model which helps you to change what you currently do in order to get a more satisfactory result in your parenting. Here is an extract from the book. If our children need to make a change we can remind them of how well they have coped with changes they have experienced such as the birth of a sibling, moving to a new room, going on holiday and making friends, starting at nursery school and so on. When you need to understand your children’s map, instead of drawing on your own experiences of being a child (although that can help) ask them about it. We can use metaphors to help children express their feelings. Whilst asking a direct ‘how do you feel about that?’ question to an adult works reasonably well, it doesn’t with children. Children will happily draw on characters they know on TV or video games, friends they know, animals or may even be able to equate it to another experience they have had. To find out more, simply reflect back what they have said in question form. We call this using a ‘clean’ question. Enter their territory by stepping into their shoes and seeing it from their viewpoint. Along the way you will learn some useful NLP techniques such as anchoring, reframing and The Time Line. This is a great book to introduce you to NLP. 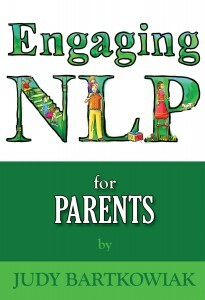 If you want a more thorough exploration of NLP you should read the ‘NLP Workbook’ or if you want more detail on how to incorporate it into your parenting, read ‘Be a happier parent with NLP’.